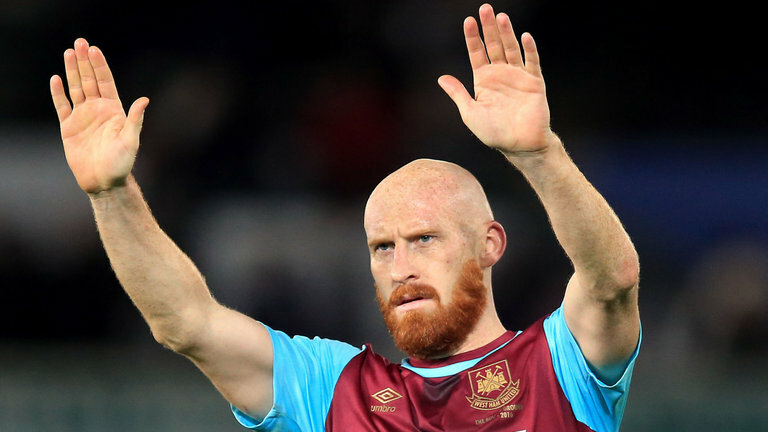 The first thing to talk about is the situation with James Collins. He has been training with the first team and before that The Academy for over 2 weeks now. Ginge does not want to leave the club; never has, never will and hoped he would do enough to persuade Pellegrini to give him a contract. At the moment this doesn’t look likely but who knows whether another defensive poor showing could change his mind, I doubt it, but stranger things have happened. Collins has a firm offer on the table from Brighton who approached him last season too. This is his preferred choice of options after West Ham because it is commutable from his Bishop Stortford House and obviously a Premier League team. Many Championship clubs have tried to lure him to their squads including QPR and Bristol City. A deal with Bristol City looked likely at one point until Brighton moved in again following injury concerns to a couple of their centre backs. Ginge hopes to have his future sorted out by the end of next week. Reece Oxford has expressed his “love” for the club this week too. This coincides with no clubs making an offer to loan him apart from Bolton who only offered 70% wages and his agent wasn’t keen for him to go there. It is hoped by both Reece and his agent (who is also the recently departed Quina’s agent too) that a German team would move for him and Leipzig had scouted him at a recent under 23s game but he didn’t perform well at all and certainly didn’t look like a man who loved the club. I hope for Reece he can turn this around because he huge potential when younger and I would hate to see him throw it away. A number of clubs have enquired to take Rice and Holland on loan and been told that they are not available but that Oxford is but they don’t seem to want to take him. Reece is still young, he has time to turn this around and has scored in the Under 23s 2-3 loss to Arsenal and hopefully this is the start of positive strides but we shall see, however if an agreeable club does move for him this window he and the club would want him to go. We move onto the match tomorrow with Mark Noble definitely confirmed as out with a back injury. This is a legitimate injury and not a cover up as some have labelled. I continuously find it astonishing how much abuse that man gets. The day he retires will finally be the day when West Ham fans look back and realise how much he did for the club. Yes he hasn’t started the season well and his contribution to Wilson’s goal was very poor. I do believe there are games that he shouldn’t start for us and I think this is a consideration that Pellegrini will also make however to celebrate him being injured is ridiculous. He didn’t take the penalty at the weekend and this was because he had missed a couple in preseason and Arnie wanted to take them for his goals record and nothing else. Noble has been picked by every manager who has managed us in his time so they all can’t be wrong. I do believe he still has a lot to offer even if it isn’t necessarily as a first team starter every week. There are four changes to the team tomorrow, of which one is Noble, as discussed. We have taken a squad of 20 to the team hotel but we only need 18 for the match squad so this means two high profile players will again miss out. With Noble out Arnautovic is likely to take the captain’s armband although I would be partially tempted to give it to Wilshire who will start against his former club. Make sure you check out our “Predicted Line Up” which will be out at around 1:30pm on this site, so far the predicted line up has been “guessed” correctly 87 times in a row now, so it is worth checking! No new contract talks have started yet as the club wait to see if any other players will leave the club on loan. There has been a few offers for some of the academy players and once the squad and wages are decided, new contract offers should be coming in for a number of players. As I tweeted in the week both Carroll and Lanzini are ahead of schedule with their injuries. Carroll should be back late November/Early December and whilst it is impossible to put a date on Lanzini’s return we should see a significant amount of him towards the end of the season which at first didn’t look likely. There is no rumoured/confirmed return date for Winston Reid. We are delighted to announce a new partnership with https://zeelo.co/rides/west-ham who are a coach company taking fans to games. They offer a number of routes through Essex and Kent that take you straight to the ground and are a lot easier than trying to get the train down. As part of our partnership we are offering all people a free return journey on the coaches if they use the following promo code, this is well worth doing as it is a free ride to a match. Here is the code: WESTHAMWAY. We hope to add our events to the journey too so our customers will be able to pick it up from Essex or Kent and come down to us. Hi Ex excellent balanced article as ever, if Ginge went to Brighton would he have it written in his contract that he can’t play against us !